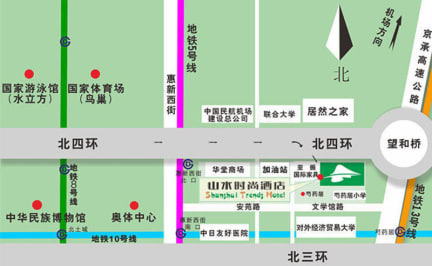 The hotel is 20 km, 20 minutes’ drive from Beijing Capital International Airport; 12 km, 20 minutes’ drive from Tiananmen Square; 15km, 30 minutes’ drive from Beijing Railway Station; 22km, 35 minutes’ drive from Beijing West Railway Station; less than 1 km, 5 minutes’ drive from Subway Line 5 and Line 13; 2 km, 10 minutes’ drive from China International Exhibition Center; 3 km, 5 minutes’ drive from Zhongguancun Science and Technology Park and Zhongguancun Electronic City. The hotel decoration is fashionable. The guestroom furnishings create a relaxed and comfortable atmosphere and provide the guests a special taste and experience. 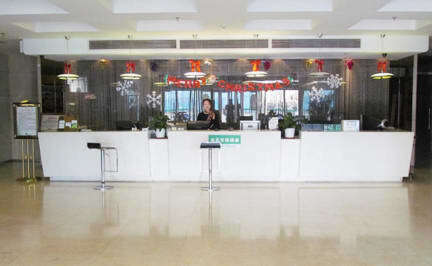 The hotel has 95 various guestrooms and many facilities like Chinese restaurant and teahouse.